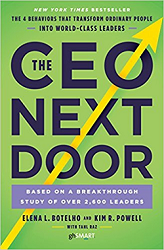 Eden read The CEO Next Door by Elena L. Botelho, Kim R. Powell, and Tahl Raz, and thought about the ordinary behaviors exhibited by extraordinary CEOs. What comes to mind when you picture a CEO? That’s the question authors Elena L. Botelho, Kim R. Powell, and Tahl Raz discuss in their book, The CEO Next Door: The 4 Behaviors That Transform Ordinary People into World-Class Leaders. The answer might surprise you as much as it did me. Like many other people interviewed by the authors, I thought most CEOs would fit the stereotype of being Ivy League educated, preferring extraversion, and having a near-perfect resume. However, I learned that not only does the average CEO fail to fit this stereotype, but the behaviors exhibited by successful CEOs are, well, pretty ordinary. You might be wondering why I read this book since I’m not sure I aspire to a CEO position, and even if I do, it’s probably several years in the future. I received The CEO Next Door through our subscription to The Next Big Idea Club. I probably wouldn’t have chosen this book on my own, but once I started reading, I realized that it has good advice for growing in my current role and implications for a project I’ve been working on this year. I hope you’ll agree with me that you can benefit from reading about CEO behaviors no matter where you are on your leadership journey. After reading these descriptions, I briefly stopped to take this self-assessment to learn more about what strengths and blind spots might be lurking in my CEO Genome. I learned that my strongest trait is creating frameworks for reliability and my weakest trait is my ability to make quick decisions. The authors are careful to note, however, that these are learned behaviors and not inherent traits. An entire chapter of the book is dedicated to practical advice for building capability in each behavior of the CEO Genome. I’ve summarized my favorite pieces of advice here, but if you’re curious to learn more, you can stop by our office to borrow our copy of The CEO Next Door. Decisiveness: Practice going with your gut feeling. Imagine you only have ten seconds to make a decision. What would you do? Engaging for Impact: Mentor others in order to help you get better at perspective-getting. Ask questions and listen intently to gain insight—don’t imagine. Relentless Reliability: Be so consistent in your ways of working that your colleagues can predict the first and second questions you are likely to ask. Adapting Boldly: Seek out opportunities for growth instead of waiting for situations when you are required to change. I’ve been practicing Decisiveness this week by using the ten second rule. Giving myself a time limit to make decisions has helped me to spend more time working on solutions and less time worrying about solutions. I’ve also been thinking about Adapting Boldly as a strategy for long-term growth. I’m currently supporting a leadership development program for aspiring corporate leaders and we encourage our participants to seek cross-functional projects or roles. I’ve seen this idea of “breadth over depth” serve our participants well in their career paths. Seeking diverse experiences is something I’ll be keeping in mind as I continue to make decisions about my own career. Take a few minutes to complete the CEO Genome quiz. I’ll be curious to learn what you discover, and whether you find any of the tips useful when you think about your own CEO behaviors.